WARSAW — Before top officials from 65 nations began meeting in Warsaw at an American-led conference on Middle East security, an unmistakable voice rang out at a rally outside the city’s main stadium, calling for regime change in Iran: the former mayor Rudy Giuliani. Mr. Giuliani contended he was there representing an Iranian opposition group, not his “more famous client,” President Trump. But his unvarnished declaration that Iran’s leaders are “assassins, they are murderers and they should be out of power” seemed to set the tone for a meeting that American officials told nervous European officials would be on a wide range of security matters affecting the Middle East, not just about ramping up economic pressure on Tehran. As Mr. Giuliani spoke to a few hundred protesters against the Iranian government from an opposition group, the Mujahedeen Khalq, or People’s Mujahedeen, Secretary of State Mike Pompeo was in northeastern Poland witnessing live-fire exercises intended to send a message to Russian forces seeking to undermine NATO. And Vice President Mike Pence, joined by the president’s son-in-law, Jared Kushner, was landing in Warsaw for what amounts to the largest diplomatic gathering the Trump administration has organized in its first two years. It is a session that makes some of America’s closest allies nervous, starting with Britain, France and Germany, all of whom have vociferously protested Mr. Trump’s decision last year to withdraw from the 2015 Iran nuclear deal. Few issues have so divided the core European allies from Washington, and in recent weeks they have all embraced a sanctions-busting barter system that would enable Iran to trade in oil, defying Mr. Trump. The French and Germans are sending diplomats to the meeting, rather than their foreign ministers. Britain’s foreign minister, Jeremy Hunt, agreed to attend at the last moment, after being promised he could lead a session on Yemen. And Prime Minister Benjamin Netanyahu of Israel arrived looking for a chance to edge closer to the Sunni Arab states that share his desire confront or contain Iran’s military. Running for re-election in April while still under the threat of indictment in Israel, Mr. Netanyahu is looking for a major win. If he could use the Iran threat as a way to openly display Israel’s strengthening relations with its onetime Arab adversaries, that would be such a win. Iran’s expansion into Syria is Mr. Netanyahu’s biggest concern, Dore Gold, the former director general of Israel’s Foreign Ministry, said, and the Warsaw summit could help persuade the international community that he is not exaggerating the threat. In response to the American-led meeting, President Vladimir V. Putin of Russia announced a summit of his own with the leaders of Iran and Turkey in Sochi on Thursday. 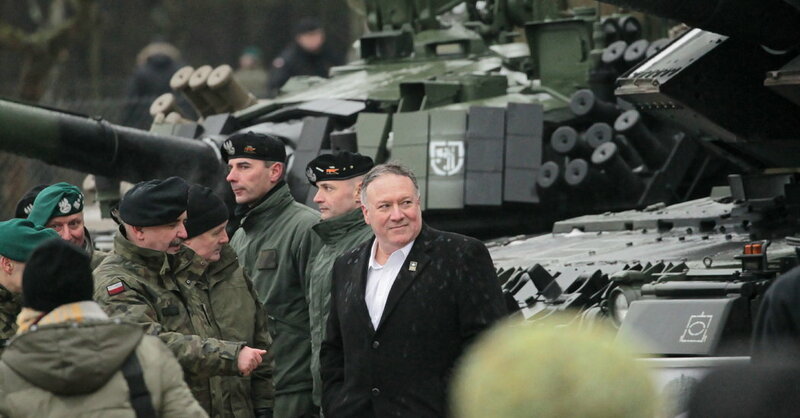 Mr. Pompeo, who visited American troops at the NATO base at Orzysz, about 40 miles from the Russian border at Kaliningrad, talked about Russia as a threat in far stronger terms than Mr. Trump has, and sharply criticized Mr. Putin’s actions. He referred to Russian “hybrid warfare” against the United States even as Mr. Trump continues to question whether Russia was behind any of the election interference in 2016. In a military briefing, Mr. Pence heard from Col. John Downey, a defense attaché who said active discussions were underway to expand the American military presence in Poland, but he added that those talks were “unfortunately” still in the “discreet discussions” stages. During a bilateral meeting with Mr. Duda, the vice president said that he would make sure Mr. Trump heard Poland’s request that the American military presence in the country “continue and even expand” from the current troop levels of around 4,500. The Warsaw conference, taking place over two days, was scheduled to coincide with the 40th anniversary of Iran’s 1979 Islamic Revolution. In Iran, the country’s foreign minister, Mohammad Javad Zarif, said the Warsaw conference would not change anything. Mr. Zarif, who has used his Twitter account to react to the many messages aimed at the Iranians by American officials like Mr. Pompeo and the national security adviser, John R. Bolton, said the aim of the conference was to issue a United States diktat on Iran. Mr. Giuliani, for his part, reveled in condemning Iran even as he insisted he was in no way speaking for the Trump administration. He said the Iranian opposition group had been a client of his for 12 years, and that he has often spoken on their behalf, often for a fee. In July, Mr. Giuliani attended a Paris rally sponsored by the Mujahedeen Khalq, known as the M.E.K. that police later said was the target of a failed bombing attempt that they suspect was engineered by Iranian agents. As busloads of M.E.K. activists arrived outside the PGE Narodowy, or national stadium, where Thursday’s diplomatic meetings will be held, a marching band belted out songs of revolution under an ashen gray sky. Posters around the parking lot bore the faces of people the organizers said had been killed by the Iranian government. The crowd waved Iranian flags and held aloft giant yellow balloons with the words “Regime Change” written in block letters. Mr. Giuliani echoed their cheers. “We want to see a regime change in Iran,” he said.